Population Research Institute has produced a series of videos attempting to prove that there are not more of us than Earth can sustain. It’s true that each billion added is a smaller percentage of the whole than the previous billion. It’s comparable to the way we age: when we’re 10, a year is one tenth of our lives, but when we’re 50 it’s only one 50th. Despite our changing perspectives, each year is still one year. A billion is still a billion. 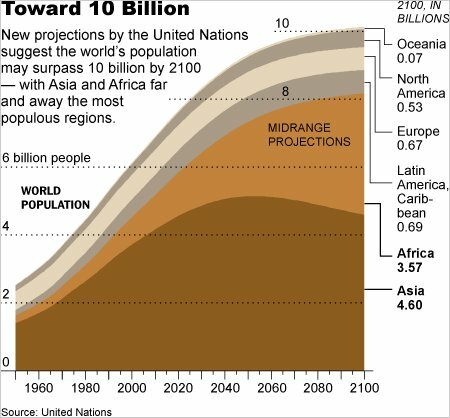 Optimistic population activists today have set their sights on an eight billion peak by mid-century. It’s considered the best we can hope to achieve, but it won’t just happen on its own: significant gains in reproductive freedom and responsibility will be necessary. To see how population growth is falling down, we look at a number called the global total fertility rate. We look at that number because the improvement in global TFR is indeed impressive: from 5.0 in 1950 to 2.5 in 2011. However, we won’t look at the number of people added each year, which has more than doubled from 35 million in 1950 to 78 million in 2011. It’s a huge number. But it’s not what you think. Unless you think it’s seven thousand millions. You are very confident about the earth’s population leveling off and then falling. How can you prove this? After all, population is still growing. Population is still technically growing, but according to the United Nation Population Division’s numbers, that growth is slowing dramatically. The United Nations Population Division (UNPD) is the most reliable source of population statistics in the world, which is why we use their numbers for our videos. 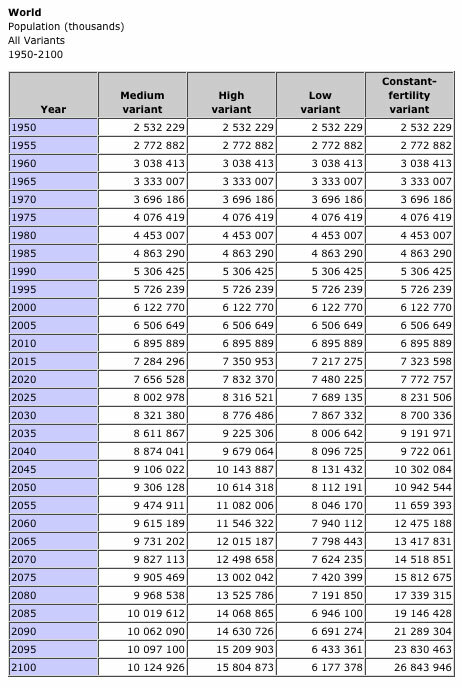 And, according to the UNPD, population growth will continue to slow down over the next few decades. In fact, if current trends persist, our growth will halt right around 8 billion by 2045. After that, our numbers will start to fall off, slowly at first, and then faster. The closest UN projection to “current trends persist” is the medium variant. No one expects fertility rates to remain constant, so the question is how fast they change and by how much. Generally, the lower fertility rates become, the slower they improve.
. . . and a billion people is a lot of people. But the way we can tell that population is not ballooning out of control is precisely the fact that we’re only adding a billion people each time. And soon, we won’t even be adding that many. One could say we’re only adding a million people each time, if a shorter time period is used. Whether this means population is “ballooning out of control” or not is another matter entirely. You claim that the UN’s predictions are reliable. How reliable have they historically been? Again, it depends on which variant you use. In our research, we’ve looked at the UN’s predictions and how they have compared with real life—and in every case the “low variant” has been the most accurate. You can run the numbers yourself here. Even if population growth is slowing down, a billion people every 15 years is still a lot of people. Isn’t this still a problem? It is a lot of people. And of course, greater numbers bring their own challenges and issues. But there isn’t any convincing evidence to show that the size of our population is the cause of the world’s most pressing issues, like war, famine, disease, and poverty. No amount of evidence will be convincing to anyone who’s already convinced. Let’s put it another way. Since we have more people, our wars are bigger. Our famines may affect more people, and more people will have diseases and be poor. But population growth didn’t create these problems—they have have existed since people have existed. In other words, we can’t blame population for problems that have been around forever. The only difference is, since there are more of us now, these problems affect more people. Excessive population density isn’t the only cause of our problems, but it’s a significant, perhaps primary, cause. As noted, population growth amplifies our problems. Why has the global total fertility rate dropped so much? Scientists are still debating exactly why, but there’s no doubt that it is happening. All over the world, birthrates have been dropping quickly, and for nearly 50 years now. Many demographers think that it is because more and more people are urbanizing (moving into large cities). When families live out in the country on farms, it makes more economic sense to raise larger families, so that they have people to help them and care for them in their old age. It’s also true that cities tend to have better healthcare facilities, which reduce infant mortality. This in turn means that parents end up having fewer children, since more of their existing children are surviving to adulthood. Debate on causes of fertility decline continues, with the above two possibilities included. Access to reproductive health services, improved status of women—which increases education and employment opportunities—and public information campaigns have also influenced fertility to varying degrees. These social improvements don’t just happen: they have to be implemented over the objections of those who oppose reproductive freedom and gender equality. They will if they overcome strong social mandates to procreate, and have the means to avoid conceptions—two major obstacles for couples all over the world. Although we have overshot Earth’s carrying capacity by 35 to 50 percent, many try to downplay our steady increase. While both our fertility and growth rates continue to improve, our density does not. A reversal of our direction won’t be achieved without significant social progress toward gender equality and the reproductive freedom which follows, including access to affordable reproductive health services. End of episodes to date.